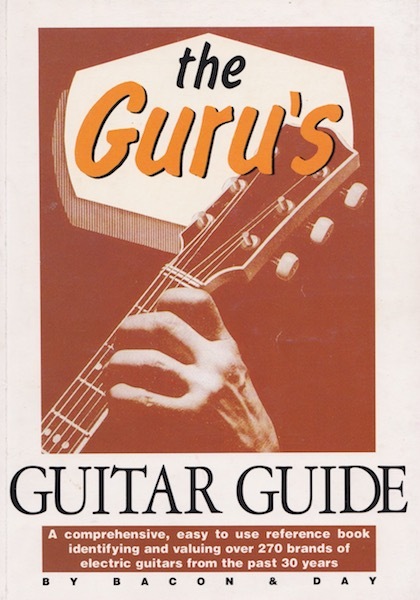 This was the first book I made with Paul Day, and we had a great time rummaging through Paul’s vast collection of catalogues and pricelists to compile this guide to electric guitar models. The idea for this little book was to provide info on virtually all the electrics available in the UK since the late 50s, up to 1990 (which is when it was published by Track Record, who also published Making Music, the magazine on which I was a staff editor at the time). We included all the major brands, naturally, but also we made a point of including as many of the smaller names as we could find. This is the Guru book’s main value today. You can find small entries on brands such as Antoria, Cairnes, Geoff Gale, Heart, Levin, Rockson, and Welson, to name but seven randomly chosen examples. Don’t expect a fancy production, great pictures, or detailed text. That came later. 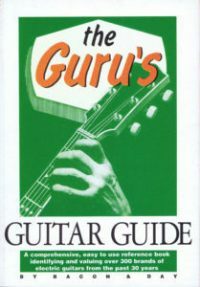 This is hard info for guitar nutters only. Click on the link here for a sample page to show how it looked, as well as a full list of brands included. A second edition with some revisions appeared a couple of years later, and it looked very similar, only in a fetching green hue (below). Paper fans will be pleased to learn that the cover image was adapted from the cover of a late-50s Selmer catalogue. Oh, and our little joke, also on the cover, is that the byline for Tony Bacon and Paul Day actually reads “BY BACON & DAY”. Fans of obscure guitar brands will know that Bacon & Day were … an obscure guitar brand.